The 2015 Content Marketing Awards showcase marketing and communications professionals who write, edit, film, and publish content that promotes a brand or organization. The 2015 entries were creative and skillfully targeted—content marketing at its best. We saw websites, blogs, videos, infographics, publications, and of course the best overall in the Grand Prize category of Best Content Marketing Strategy. This year’s Content Marketing Awards showed that brand journalism and content marketing have in the last few years become sophisticated, powerful tools in brand marketing. We can’t wait to see what 2016 will bring! 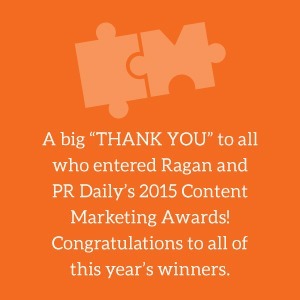 And now…the winners and honorable mentions in Ragan’s 2015 Content Marketing Awards!